When it comes to heating and cooling your home, you can always count on JDL HVAC Services to have the extensive knowledge, workmanship, and customer service you rely on. We work with folks throughout Odenton, Laurel, and Severna Park (and the surrounding region) here in Maryland, and we provide services for both heating and cooling systems. We offer installations, repairs, and maintenance services for our neighbors throughout the area, and we’d be happy to help you, whatever your current needs may be. If you’re ready to get your HVAC project started, we’re anxious for your call — simply reach out to us to get a quick quote. You can also learn more about our HVAC services below. Whether you need to install your first furnace in a new home, or you need to swap out an old furnace that is burnt out, we can help. We provide furnace swaps and installation services, and we can retrofit your current duct system with a new unit. We can also work with you to understand the demands of your household, so that we can advise you on the best furnace make and model to suit your home. We strive to make our installations as quickly as possible — often within the same day that you call — so that you can enjoy a comfortable, warm home right away. Large temperature fluctuations: While some temperature fluctuations are normal, your home’s temperature shouldn’t be changing more than a couple of degrees between heating intervals. If you notice that your furnace isn’t consistently warming your home, then you may have an issue with the thermostat and zoning of your vents. We can assess the issue at hand and provide you a solution, so that your home is consistently comfortable. Little heat: If your furnace is turning on, yet it isn’t keeping your home warm, then it isn’t doing its job. Poor heat can be caused from a litany of issues, so we’ll have to stop by to pinpoint the problem at hand. You may have a gunked-up air filter, you may have a bad blower fan, or you may have blocked ventilation, among other issues. Complete failure: If your furnace simply won’t turn on at all, then it may require a repair, or it may be time to invest in a new furnace. We can assess the situation, and we’ll let you know your options before we provide a solution. Pilot light/ignition failure: If your pilot light has gone out and you can’t get it to reignite, then you may have a further issue. We can take a look at your pilot light to see if it has become gunked up. You may also have an electric ignition that can fail. We can swap out your ignition, or ensure that your pilot light is operational once again. In either case, be sure to shut off the gas to your furnace while you’re awaiting our help. Thermostat issues: If your thermostat is poorly calibrated, or if its in a bad location in your home, then you may notice that your home won’t maintain your desired temperature — even when you adjust the settings. We can take a look at your thermostat and propose a solution. Fan issues: Your fan should pump heated air throughout your home. And without an operational fan, that hot air will stay in your furnace. We can assess motor and electrical issues that can occur in heater fans. Duct problems: If you have ducts that are obstructed, or if you have ducts that are leaking, then you’ll lose precious warm air. We can track down any duct problems that you may have, in order to keep that hot air flowing. Maintaining your furnace isn’t just a good decision for the efficiency and energy savings it will provide, it’s also a wise choice since it will ensure that you don’t run out of heat when you need it most. We offer a seasonal maintenance plan that is designed to keep your furnace running at its best for years on end. Feel free to learn more about the various maintenance services that we perform with each maintenance appointment. Keeping cool in the height of summer couldn’t be easier with JDL HVAC. We’re the only crew that you’ll have to call to ensure that your home is well prepared for the coming cold season. From an initial installation to intermittent repairs and continual maintenance, you can count on our team to ensure that your AC unit or heat pump is operating as it was designed. If you need to install a new AC unit or heat pump in your home, we can help. We work with both AC units and heat pumps, and we’d be happy to guide you towards the best system for your home’s cooling needs. We can also retrofit your current ventilation system to your new unit if you’re changing to a different make or model. Large temperature fluctuations: In the same way that your furnace should maintain fairly consistent temperatures throughout your home, your cooling system should be relatively level. However, fluctuations can occur if your unit has an issue. Often, AC units can become overworked if their evaporator coil freezes over, which can cause temperature fluctuations. What’s worse is that a frozen coil can further damage the system. 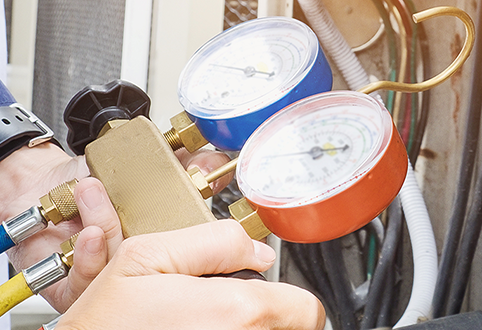 If you notice large fluctuations in the temperature of your home, it’s best to have your system checked right away. Little cool air: If you aren’t getting much cold air out of your cooling system, then it can be concerning, and you may have any of a number of problems. Give us a call and we’ll check out your cooling unit to assess the exact issue at hand. Complete failure: A complete cooling system failure is even more concerning, and it may be caused by a variety of issues — from a broken blower fan to electrical issues. Again, reach out to us and we’ll take a look at your system. Thermostat issues: Your thermostat should trigger your cooling system to turn on. However, if you have a thermostat that is placed poorly in your home, or if you have a thermostat that is uncalibrated or broken, then your cooling system could be underperforming. Let us take a look. Frozen evaporator coil: Your evaporator coil is responsible for cooling the air that is pushed through your home. However, this coil can freeze over if your unit is constantly on, or if your compressor is failing. We can thaw and fix your evaporator coil to ensure that it is operating efficiently. Fan issues: Your fan should push cooled air through your home, and a failed fan will render your cooling system useless. We can fix electrical and mechanical issues with your fan, or replace it if need be. Duct problems: As we mentioned, your ducts can cause problems if they are blocked or there are cracks in the network of ducts. Call on us if your ducts are no longer efficient. When summer rolls around, you don’t want to be caught off guard with a cooling system that isn’t operational. We provide cooling system maintenance services that are intended to keep you from running into issues when you least expect them. From oiling the mower to ensuring that your evaporator coil isn’t frozen over, we’ll do our utmost to ensure that your system is running as it should. Our seasonal maintenance services are designed to keep your cooling system running year after year, while operating efficiently and saving you money. Feel free to read more about our seasonal maintenance services. If you’re ready to get your HVAC project started, just give us a call. Again, we provide heating and cooling services for folks throughout Odenton, Laurel, Severna Park, and the surrounding area. Feel free to take a look at our service area as well.